Running one marathon—26.2 miles—is a feat most people can’t see themselves completing even just once in their lives. Prior to signing up for the World Marathon Challenge, Geneseo alumna Cara Nelson ‘09 had never completed a race of this caliber. That changed, however, between Jan. 30 and Feb. 5, when Nelson ran seven marathons across all seven continents in just seven days. 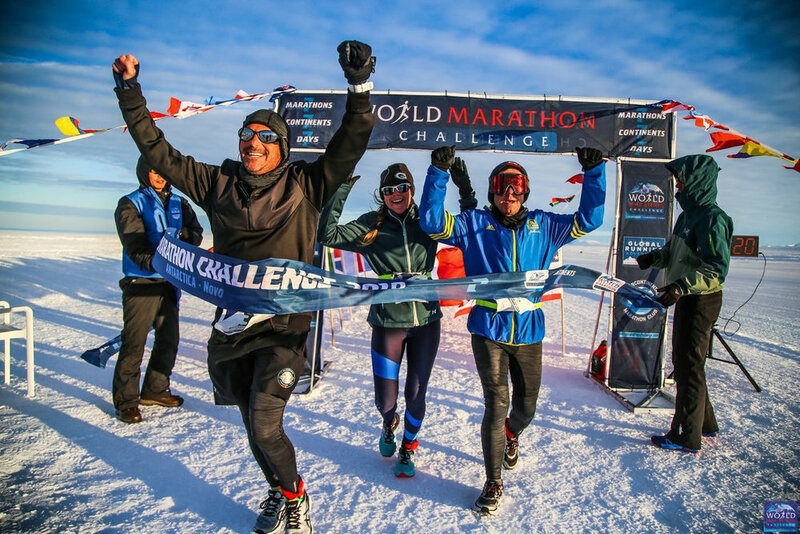 With a year and a half of training behind her, Nelson and the other World Marathon Challenge competitors landed in Antarctica on Jan. 30 to kick off the week-long event and run the first of seven marathons. Nelson completed the first marathon in just less than five hours. Almost immediately after crossing the finish line, all of the competitors were on a plane to Cape Town, South Africa for the next race. While each of the seven marathons were special in their own right, the Cape Town marathon is one that stood out to Nelson. It was after finishing that second marathon that she knew she would be able to finish the rest. Nelson finished the Cape Town marathon in a little over five hours before hopping on a plane to Perth, Australia. From Perth, the fourth marathon took place in Dubai, United Arab Emirates and the fifth was set for Lisbon, Portugal. The sixth race in Cartagena, Columbia gave Nelson some trouble; the participants had to run on cobblestone streets for many miles and confusion arose after they realized that the course hadn’t been marked correctly. The seventh marathon took the 50 runners to Miami, Fla. and upon finishing that final race, Nelson felt a sense of relief, happiness and sadness all in one moment. Nelson spent 18 months preparing and getting in as best physical shape as possible, but she knew her mental preparation would play just as important a role in getting her across that seventh finish line. “I did all the physical preparation in the world. Mentally though, I didn’t know what I would actually be able to prepare because you had no idea what was to come in any of these races,” she said. Nelson credited her perseverance and willingness to conquer any challenge to helping her complete the competition. If someone had told her while attending Geneseo that one day she would complete seven marathons in one week, Nelson said she would have laughed. As a student, Nelson worked out every so often and was member of both the club ice hockey team and club soccer team. Despite considering herself a runner all of her life, a feat like this is something she never thought possible. “Goes to show you that all it takes is hard work, dedication and the mental fortitude that you can do it,” she said. For Geneseo students who also have goals that may be considered too big, Nelson advises that they continue to follow these aspirations, because anything is achievable.